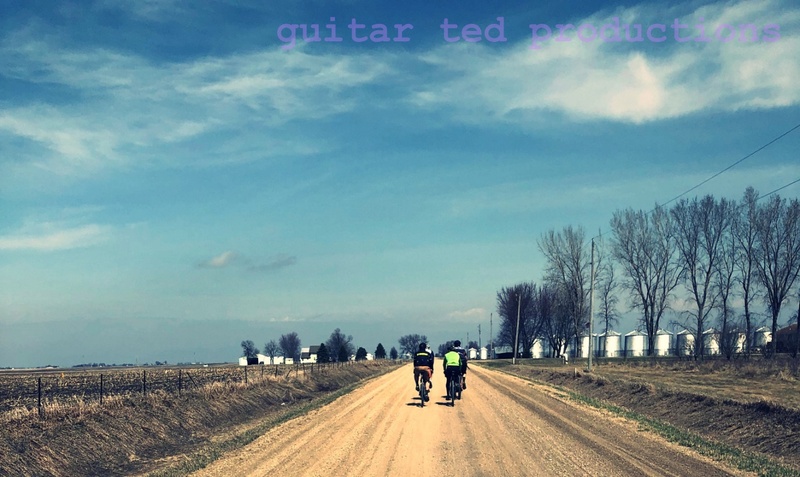 Guitar Ted Productions: This Post Is Cranky! The best crank set format ever made. There once was a time when bicycle crank set choice was not predicated upon whether you were a "roadie", a mountain biker, adventure cyclist, or a gravel rider. There was one crank set that could cover all those bases, and more, with a simple swapping of chain rings and adjustment of chain line. Now days, things are not at all like that. This was the genesis of the discussion I was having yesterday with Grannygear, via messenger. First, I have to say that in all my years of knowing Grannygear, it has been a joy to be able to have differing viewpoints AND have a civil discussion about it. Trust me, Grannygear and I don't always agree on things. But when we discuss our ideas, we are both respectful to one another, we listen, we consider, and then, as in many cases, one or the other of us, (and sometimes both of us!) change our tune a little bit. The crank thing! Right then.... Okay, so we were discussing gearing, specifically for gravel travel, and we both had different ideas of what that should look like for both of us. Which, after a bit of thought on the matter, turned into a revelatory thought. That being that the bicycle manufacturers, specifically parts manufacturers, have us pigeonholed into niche groups. They are trying to come up with multiple gearing solutions for smaller pieces of the pie that are demanding different things from their bicycles. The other thing is that, while doing the solution in the form of parts, the manufacturers have developed niche standards, not cross-compatible with others. This has led to much consternation on the part of riders who often are left with a compromised set up because they cannot customize their gearing to their individual needs and for where they live and how they ride. Not that square taper cranks are better, but the 110/74BCD format was better. Now, if you want to get a certain gearing set up, you have to accept current "standards". Like the limited chain ring availability on 1X, or the big jumps in between gears on those 1X specific cassettes, or the proprietary bolt circle diameters, (BCD's) of many cranks on the market. These standards, so-called, are limiting, not customizable, and not cross-compatible. This leaves many riders wanting for certain gearing set ups, that for them, would be better than what is out there now. If not better, than at least something a rider could experiment with, and then return to a previous incarnation without major component expense. This, in my view, is a barrier to making cycling more accessible to many of us. I picked on the old 110/74BCD crank as being reflective of a time when gearing wasn't proprietary to a certain style of cycling or specific manufacturer of parts. That bolt circle diameter, and arguably the 94/58 as well, were the epitome of cross-compatibility and customization of gearing. You could get a double or triple chain ring set up and then combine that with almost any combination of chain rings. Go nuts. Do weird jumps, half-step gearing, wide, bail-out grannys, or even just one gear. A few stock crank sets could cover almost anything the cycling world put out. Arguably, we could have that today as well. 4 bolt, five bolt arms, cartridge bottom bracket, adjustable chain line, pipe spindle bottom brackets, I don't care, just pick one type, make it 110/74 BCD, and then 11/12 speed compatible and let's get on with this. No one would complain a bit because you could set your bicycle up in about a 100 different ways to accommodate anyone's gearing needs. But what we don't need is arguing over what chain ring sizes are "gravel" and what ones are not. That is stupid and ignores the real issue at hand, which is the proprietary nature of what the component manufacturers have to offer us. It didn't used to be so much that way, and it shouldn't be now either. Hate to sound like a shill for Compass here, but what about the Rene Herse crank? 70mm BC. Three crank bolts( you're only ever sitting on three at one time anyway). Big rings from 52-42. Middle/small rings from 44-24. Double or triple. Low Q. What's not to love? Admittedly not cheap but cheaper than high end Campy and Shimano. It's biggest defect is it's classic styling. It's prolly not "manga" enough to look right on the lastest plastic fantastic carpet fiber bikes. @Phillip Cowan- It isn't how many bolts that are loaded at any one time as much as it is chain ring flex. The longer the distance between the bolt and the chain where it engages the ring, the more lever length there is for the chain to effect deflection upon the chain ring. Some argue this is why 110BCD is not ideal. Shimano, of course, combats this by giving their chain rings more three dimensional support and fills the voids created by those shapes with carbon fiber for added resistance to deflection. This is a big reason why their front derailleurs operate so well. So I don't think Compass crank sets look bad, have too few bolts, or aren't "whatever" enough to be spec'ed as much as I feel that this design and bolt circle diameter in combination make it difficult for the operation of front derailleurs. Thats a valid point but I haven't heard anyone complain about poor shifting up front. All manga jokes aside all these small BC cranks have the same weakness (Herse,TA,Stronglight) and that is that someone with gorilla quads in too high of a gear can fold the big ring in half. The modern versions(Velo Orange,Luxe,Compass) seem to aknowledge this because they've all thickened the rings to resist deflection. To be fair I haven't seen this happen to any of the modern versions although if you search the interwebs you could probably find an example. Heck, if you look long enough you could probably find a folded Campy Piste chainring(144 BC). Isn't the answer to this the White Industries VBC crank and chain rings? I have never had one or put hands on one even but they look to be the ultimate answer for gearing flexibility. I hear ya! I run modern Sugino OX601D cranks on my rig. They conform to the same good, old 110/74BCD standard and let me run whatever chainring combo I need. Currently, I'm enjoying 42/26T on my "gravel" bike. I have a White Industries VBC crank on my road bike and a Sugino OX601 crank on my dirt road bike, both with 46/30 rings. Both are good solutions. But what would be better, and what I believe GT is saying, is if cranks like the Sugino with 110/74BCD were readily available from the major companies like Shimano and SRAM. Then we would see a return to the days where many brands made aftermarket rings in a variety of compatible combinations and customization was easy. What I didn’t realize on the Sugino OX601D style cranks is, to run two(2) 110bcd rings, longer chainring-bolts and spacers are used to mount the smaller ring to the larger ring. The Touring Series: The Rapid City Scene! The Touring Series: I Give Up!